This is a Jaffa Coffee and Nuts face and body scrub! 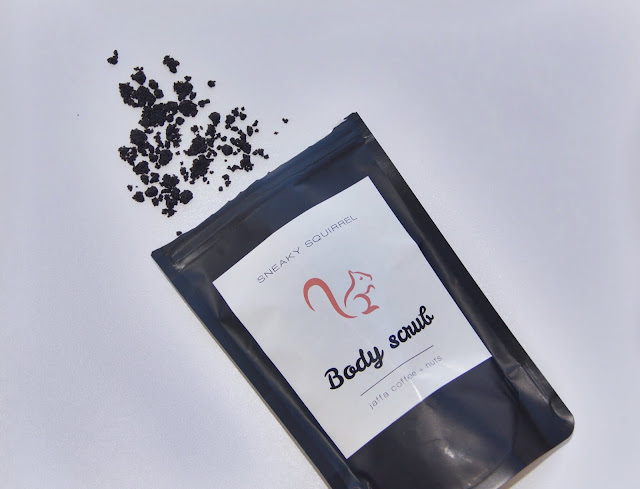 I love body scrubs, personally I have never tried a coffee scrub until now! I don't particularly like the smell of coffee so as soon as I opened this I was a bit shocked and overwhelmed! However, once you have this on your body and have scrubbed it off the smell is beyond amazing!! The texture of this product is amazing and really helps remove all the dead and dry skin! I am sure if you faked tan this would be an excellent remover! Or perfect to make your skin smooth before you fake tan! The first time I used this I felt an instant difference in my skin! It felt very smooth and soft! I highly recommend this! This has natural and organic ingredients in it! It's NOT tested on animals and has no nasty chemicals! This product is $17.95 and you get an amazing 200gms of product! You can by this from the Sneaky Squirrel website here! I really hope Sneaky Squirrel releases some new products in the future! I would be very intrigued to try some different scented body scrubs! If you have sensitive skin I believe this would work well with your skin! I have heard many people say this clear acne, helps with stretch marks and many other skin issues! If you have cellulite, eczema, flaky skin, I highly suggest giving this a go! You will not be disappointed! Overall this is a lovely product! I highly recommend it! The packaging is very nice and really easy to use! It is resealable so it's not going to spill every where and you don't need to worry about finding a home for this because the packaging is cute and looks amazing in your shower or on the bathroom vanity which is where I keep mine! I will most definitely repurchase this and maybe even try out some different coffee scrubs in the future!